Opponents of the decision to change the name of Washington-Lee High School have long claimed the School Board improperly cast aside its established engagement process on the matter — but the school system has now provided its most robust rebuttal of those charges to date. A trio of students at Washington-Lee are hoping to block the school’s renaming with a lawsuit targeting the School Board and other top Arlington Public Schools officials, arguing primarily that the Board rushed a vote on the issue and failed to follow its proscribed process for accepting public comments on the name change. The Board and its lawyers have already asked a judge to toss out the suit, claiming that the question of whether Board members followed their proposed engagement schedule is irrelevant in the legal proceedings. But, in a legal memorandum filed in late October, the APS lawyers argue extensively that the Board “properly followed its procedures in voting to rename W-L,” should the students’ legal challenge survive a judge’s scrutiny. In short, name-change opponents have accused the Board of misleading the community by promising a two-step process, and not delivering; they argue the Board pledged to first revise its policy for naming all county schools, then consider whether to change Washington-Lee’s name specifically. Instead, the Board changed the naming policy, then voted to rename W-L all on the same night back in June. However, in the Oct. 26 motion, the School Board’s attorneys argue that name-change challengers have misunderstood what Board members promised to do. That means the lawyers believe Board followed its planned process during its June meeting, despite the claims to the contrary. The Board’s attorneys do note that Superintendent Patrick Murphy did proposed a “modified procedure and timeline” for the process in January, which did allow for a separate round of community engagement and Board vote on a potential W-L renaming. “Plaintiffs’ specific allegations that the School Board gave no advance public notice that the revised naming policy would be considered for a vote — and that the amendment was not circulated to the public in advance of its June 7, 2018 meeting — are both factually contradicted by the plaintiffs’ own amendment complaint and exhibits, and are legally irrelevant in any event,” the lawyers wrote. Certainly, there are a variety of other legal arguments that the Board’s lawyers make to justify their earlier request that the case be dismissed. They believe the students don’t have standing to sue — as all of them are currently seniors, and won’t be attending the school by the time it’s set to be renamed in fall 2019 — and that the lawsuit improperly targets Board members and school leaders in their personal capacities, rather than the Board as a whole. The attorneys also point out that a Fairfax County Circuit Court judge dismissed a similar legal challenge to the renaming of J.E.B. Stuart High School in Falls Church earlier this year. That school is now known as Justice High School. The students and their attorney now have until Dec. 7 to file a motion rebutting the Board’s claims. A judge is set to hold a hearing on whether the case can go forward on Dec. 19. 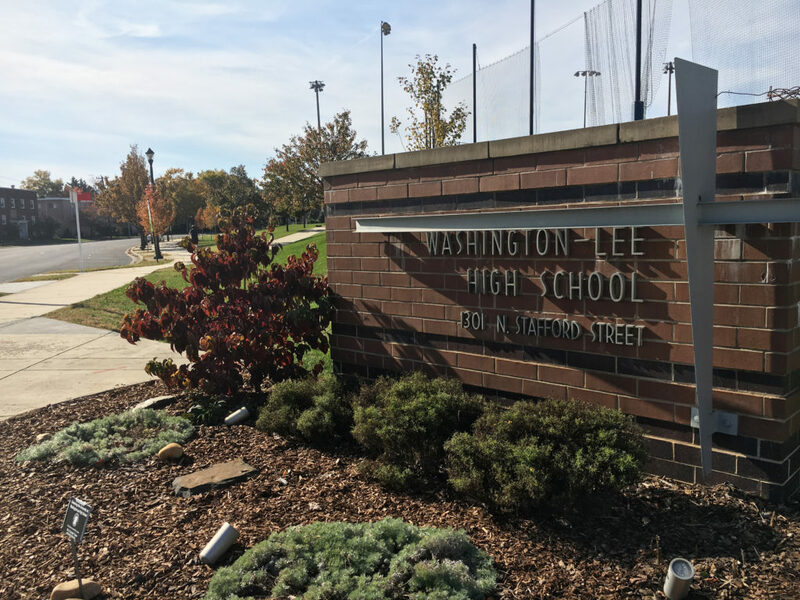 Meanwhile, the Board has pressed ahead with the renaming process, in the hopes of voting on a new name for Washington-Lee next month.